SailSafari stands for good times and magical moments. We know the waters well and have a lot of history we'd like to share with you. This is how it works: You charter the yacht with captain. All the rest will be taken care of by us for you! So you can just relax and enjoy the cruise together with your friends, family or business partners. Along the way you will be able to participate as a crew member and unfold as a helmsman or "fokkeslask"! Here are some suggested itineraries, please come with your own wishes, and we will tailor make a day or evening on the beautiful fjords. The day cruises starts and ends in the port of central Stavanger, in the harbour nearby the Petroleum Museum. You will find a map on the end of this site. This private trip to the Lysefjord is going through exciting and varied waters. Along the way you may encounter eagles, seals and porpoises. Lysefjord with its spectacular rock formations are among the world's premier destinations. There will be several stops during the voyage, we will get very close wild, dramatic nature. You will spot the Pulpit Rock from underneath, 604 meters below at sea level, and we will sail into the Vagabond Cave. We will feed wild goats residing on a small steep hill close to the sea. During the cruise you will be served a traditional Norwegian lunch, based on local seafood. We have fishing gear onboard, and you can try to catch fresh fish for the meal!If you would like an extended day cruise lasting longer than 6-7 hours, we can arrange it too. Is there spesific activites you would like us to put in? You charter the yacht with captain, and all is being taken care of, so you can enjoy the cruise together with your friends, family or business partners. 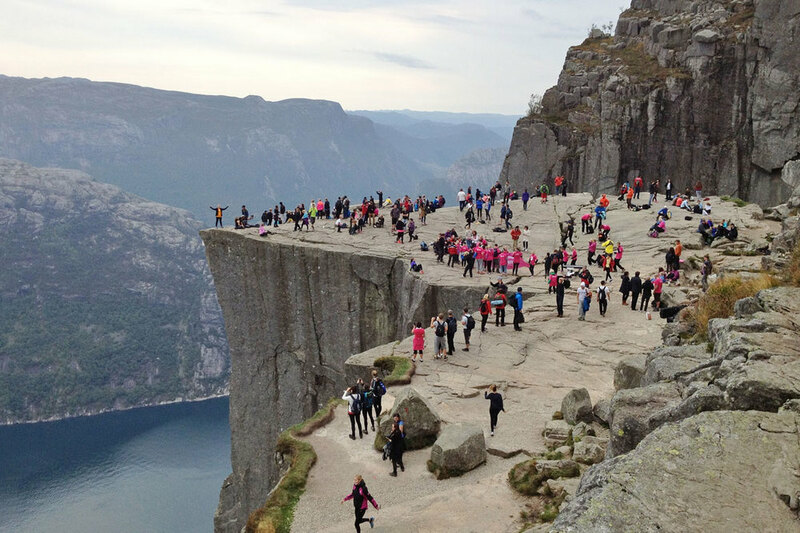 This trip is an extended Lysefjordcruise wich includes a fantastic hike to the plateau of the Pulpit Rock. After a two hour fjord cruise, we will provide you with a private guide, taking you all the way up to Preikestolen, a hike of approximately 2 hours each way. Now you will be able to enjoy the spectacular Lysefjord from a totally different angle! If you would like another activity than hike to the Pulpit Rock, we can arrange it too! Back onboard the yacht, a tasteful and well earned meal is waiting for you. While the cruise continues further into the Lysefjord, we will see more of the magic rock formations and mountain walls from below, feed wild goats, drink fresh water from the waterfalls and treasure hunt for glimpses of wild life. You charter the yacht with captain, and all is being taken care of, so you can enjoy the cruise together with your friends, family or business partners. Stavanger's archipelago has much to offer. About a stone's throw from the harbour of Stavanger we find the beautiful islands and remnants of ancient coastal culture. Sit down on the front deck, feel the gentle breeze, gaze at the clear, blue surface of the fjord, while seagulls flying longside, scouting for their next meal. Or - participate as a crewmember if you are interested in learing about sailing, navigation and seamanship. We guarantee that you will enjoy this comfortable journey through sheltered waters, very close to the wildlife. We will probably encounter sea eagle, seals, porpoises, and different species of sea birds, so bring with you your camera! You charter the yacht with captain, and all is being taken care of, so you can enjoy the cruise together with your friends, family or business partners. Ryfylke has a vast diversity of natural wonders and adventures. The scenery is very varied from open sea crossings, deep and steep fjords, small island and islets and narrow straits. We can add up to several alternative route selection, depending on available time and your desires. Our favorites of charming and idyllic destinations in Ryfylke: Østhusvik, Sjernarøy, Nedstrand, Hjelmeland. There will be served a Norwegian style tapas buffet onboard, with local seafood from the fjords. We can recommend Spa-hotel Velvære, Hjelmeland as the final destination! You charter the yacht with captain, and all is being taken care of, so you can enjoy the cruise together with your friends, family or business partners. If you have a special person or occasion to be celebrated, or you just want to collect a good team to go on a trip, this is a great option. Boarding in central Stavanger, and you get served refreshing bubbles along the way. The trip goes between the islands and islets in Stavangers beautiful archipelago. This is an easy-going cruise in sheltered waters, with low pace and slow turns on the steering wheels! Have you ever been served champagne while chilling in a hammock on the forward deck? Bring your swimsuit for a refreshing dip in the fjord! You charter the yacht with captain, and all is being taken care of, so you can enjoy the cruise together with your friends, family or business partners. Welcome aboard, welcome to the table! We want to serve the best the Stavanger region have to offer in terms of culinary experiences. Stavanger is the Norwgian capitol of foods, and we have rich traditions on serving a wide selection of seafood and shellfish. Do you prefer an exclusive seafood buffet with ingredients sourced from the waters we sail in? Or a meal based on the traditions, ingredients from the Viking Age? Or maybe tapas or sushi? The possibilities are numerous, the choice is yours. Welcome to the captains table! You charter the yacht with captain, and all is being taken care of, so you can enjoy the cruise together with your friends, family or business partners. Join the Viking raids. We will sail the Viking's wake and look for traces and history of our ancestors. In the area nearby Stavanger are several historic sites relating to the Vikings, and we go out on the fjord to give you this unique experience. We will bring modern deep sea fishing rods and equipment, going for the big fish swimming in the blue sea. You will be involved preparing a small meal of the catch, the Viking way... If there is a lack of fishing luck, you will be served a taste of traditional Viking food and beverages instead.